Identification: Wings are brownish orange. 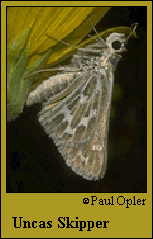 Underside of hindwing has white veins, white spots extended along the veins, and black submarginal patches. Life history: Males perch on tops of small hills or mesas to await females. Females lay eggs singly on or near the host plants. Caterpillars eat leaves and take shelter in tied-up leaves. Flight: One brood from June-July in high elevations; two broods from May-September in the remainder of the range. Caterpillar hosts: Blue grama grass (Bouteloua gracilis) and needlegrass (Stipa). Habitat: Short-grass prairie, sagebrush, open woodland. Range: High plains from central Alberta east to southern Manitoba; south to east-central California, southeast Arizona, west and north Texas; south to southern Mexico. A stray to southwest Iowa and eastern Minnesota.